I’m sure you’ve heard about the opioids crisis. A large percentage of people who have opioids addiction have been given prescription narcotics. Usually this is for pain of sudden onset, whether from surgery or injury. This situation too frequently leads to chronic dependency. People suffering with chronic pain often need long-term pain treatment. Again, narcotics are prescribed and often lead to addiction. Painkillers do nothing to treat the cause of the pain. It’s a way better strategy to deal with the cause of the pain that the simply cover it over. 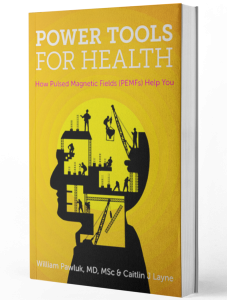 Pulsed magnetic fields, discussed when I was on the Dr. Oz show, are a much better solution, designed to heal the cause of the pain as well as provide pain relief. Here are some of the examples of how effective PEMFs are for pain. How can PEMFs help with joint pain? Joint pain: In an 11-year study on 3,014 patients with joint pain, 79% effective. Carpal tunnel pain: 93% effective. Back pain: 95% had pain relief in a series of studies. Including those suffering from— herniated discs, spinal nerve compression, sciatica, even worn cartilage. Elbow pain: In a study on tennis elbow pain, PEMF was more effective than steroid injections. And patients treated with PEMF reported less pain during activity, at rest and while sleeping. How can PEMFs help with migraines? MIGRAINES: 88% effective. As a result, the FDA has approved magnetic therapy for migraines. These are only a few examples. PEMFs have been shown to relieve virtually every type of pain. And here’s something even more amazing: researchers discovered that PEMF produced an effect that was the equivalent of 10 mg of morphine for treating pain, safely and without the risk of addiction. The bottom line is that opioids have created a crisis. The fact that they do nothing for the cause of the problem is an underlying issue. As you can see from the above studies, pulsed electromagnetic therapy should be considered when dealing with many forms of pain.